They formed back in 2005, performed to 170,000 fans at Reading and Leeds festival this year, and now they’ve been awarded Zane Lowe’s Hottest Record in the World for their track ‘Boston Square’. They’re Deaf Havana; the four-piece English classic rock-band from Norfolk and I had the pleasure to chat to vocal lead James Veck-Gilodi earlier this week. So James, your new album ‘Old Souls’ was released on September 16th, sounding slightly more classic rock. Why the change? We tend to change our music from album to album, but for the first time, I’ve had time to sit down and write the album. I think the new sound came naturally and that’s why it’s a change. The album’s been received really well both critically and from fans, are you happy with the success so far? I’m ecstatic! I was really worried that people were going to hate it if I’m honest so the success is even sweeter. It’s really uplifting to have your music appreciated so much. You kick off your tour next week in Southampton, with guest support from Charlie Simpson (of Busted and Fightstar). Why did you choose him? We met him a while ago and thought he was a really nice and cool guy. Tom (Ogden) loves his acoustic material and we thought he’d be great to tour with and a lot of fun. The track ‘Boston Square’ from the new album received Zane Lowe’s Hottest Record in the World in May, how does it feel to have someone of that calibre recommend you? It feels amazing! Zane Lowe’s Hottest Record in the World is known as a great accolade and we’re still quite unknown and a new band to the public. To have support from such a big name in the music industry is insane. James, your brother Matthew joined you on lead vocals for ‘Mildred’, did you enjoy working closely with him? Do you think the family connection gave the track some depth? Matthew has worked with the band before on writing and performing but yeah, this was the first time that he’s been heavily involved. It was fun to give him the reins and see what he’d do with it. Matthew wrote Mildred and I’m really happy with the outcome! On a different note, what’s your take on British rock music entering the mainstream music scene, for example, You Me At Six becoming another UK band to enter the top 40 charts? There are so many new and different scenes to the music industry that have changed a lot. I think it’s always been a struggle for rock music to break through and try and avoid commercialisation and stay individual. There are loads of different and new bands appearing all the time, so I think it’s really cool that bands are getting their break and showing the wider audience what they can do. 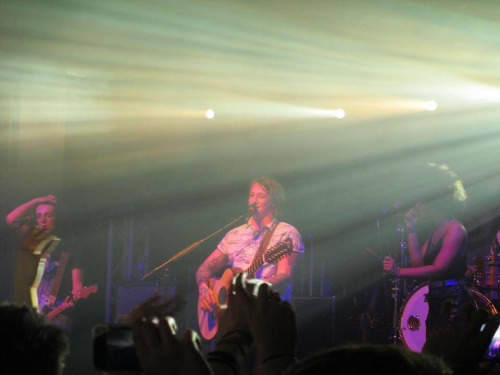 Lastly, in the foreseeable future, where do you see Deaf Havana going? Any new projects in the pipeline? Solo work is always an option. I get bored easily and change my mind a lot so I like to play everything by ear. As long as the fans and public are happy then I am, we’re just concentrating on the new tour and album at the moment and trying to make them a big success.